A distinctively pink soft rot has been repeatedly observed on samples of root parsley (Petroselinum crispum var. tuberosum) from different regions in Germany since 2015, and pink pigmented bacteria were consistently isolated from these roots. 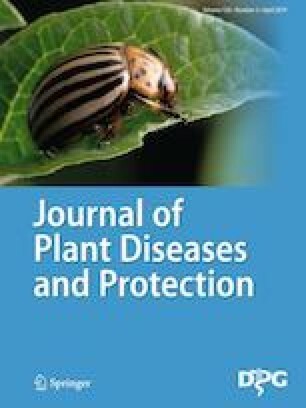 As indicated by their biochemical properties and sequences of the gapDH and rpoD genes, the parsley strains were identified as Erwinia persicina, a species closely related to E. rhapontici. In pathogenicity tests, E. persicina was shown to successfully colonise healthy parsley roots after wound inoculation. However, the developing rot was not as pronounced as in the field samples, and other as-yet unknown factors such as environmental conditions, feeding insects, or other pathogenic microorganisms seem to be contributing to symptom expression in parsley roots. As suggested by reisolations performed from the inoculated roots, fresh commercial parsley roots may be latently contaminated with both E. persicina and Pectobacterium carotovorum subsp. carotovorum. The latter in particular might be part of a complex of factors leading to the distinctively severe symptoms observed. The characteristic colour of the affected roots suggests the involvement of E. persicina and the name “pink rot of parsley root” for this previously undescribed disease. The authors wish to thank Melanie Friedrich-Zorn, Bianka Huber and Sigrid Ziegltrum for excellent technical support. Birgit Zange (Hochschule Weihenstephan Triesdorf) and Korbinian Bogner (Bioland e.V.) are acknowledged for the good cooperation during an early phase of the project, and for providing samples.